MACULAR DEGENERATION is the leading cause of severe vision loss in Americans over 50 years old. It is a major cause of blindness throughout the western world in all populations, particularly those of European descent. It runs in families and can occur independently. There presently is no cure. That's the bad news. The good news is that we can slow its progression if we catch the disease early. The retina is the light sensitive layer on the back of the eye that enables us to see. The macula is the microscopic spot on the retina with resolution capable of allowing us to read, to drive, to watch TV, to identify other people, to focus on a single object, to identify individual colors and to appreciate details such as in artwork. The macula is responsible only for central vision, but without it, most people are functionally blind. Macular degeneration, also known as AMD (for age-related macular degeneration) is generally seen in older adults with women being diagnosed more often than men. Some other risk factors include smoking, hypertension, diabetes, obesity, sun exposure, high cholesterol, light colored eyes, long term use of birth control pills and cardiovascular disease. Macular degeneration can take years to develop and is initially more noticeable in one eye compared to the other. Covering one eye and comparing the quality of vision with the other is a good screening tool. The earliest symptoms include having a stationary blurred spot in the center of your field of vision, needing more light to read, colors not being as vibrant as before, noticing a distortion or waviness when looking at objects or print and an overall haziness to your vision. Once the disease has begun to erode a person's vision, it has progressed significantly and is very difficult to slow down and virtually impossible to stop. There are now some treatments that have proven to delay the course of the disease, but the very best option is early screening and diagnosis as it is now possible to identify subtle changes in the macula years, sometimes decades before any vision loss occurs. The Palmer Eyecare Center has MRI-type instrumentation with thousands of times magnification that takes cross sectional images of the macula, which is less than the thickness of 2 strands of hair! It is non-invasive, there is no radiation and it is as simple and quick as having a photo taken. We can identify the earliest changes that might lead to macular degeneration and if some changes are detected, choose to begin some nutritional treatment that has been proven to slow down the progress of the disease. 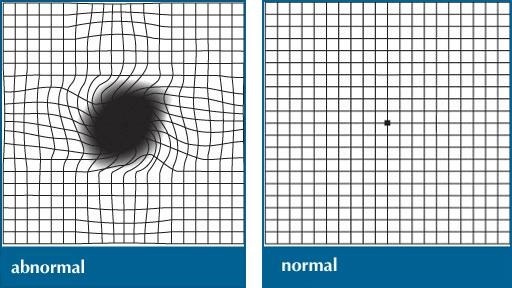 The great news is that with early detection, macular degeneration doesn't have to lead to the loss of functional vision. By covering one eye and carefully appreciating minor differences with the other eye, you may be able to spot very early progress of the disease. While some other diseases and conditions may be responsible for the changes, macular degeneration is the most serious. To be certain, we can carefully evaluate your macula in our office. We are offering macular degeneration screening appointments at our Middletown office for anyone wishing to establish a baseline reading or interested in knowing the status of their macula. It takes about 15 minutes. The results will be available immediately and you will be able to discuss the results with one of our doctors. The cost is $69.00 which is not covered by any insurance. Please call us at 860-346-2020 to set up a convenient appointment.